Worried about big business rivals? Don’t wait around — take a look at some ideas of how to compete and succeed. Compete on your own terms. As a small business, it’s unlikely you’ll be able to compete with larger competitors on the basis of price alone. Give your customers something other than bargain prices. Capitalize on your advantages. Establish close bonds with customers, and provide services tailored to their individual needs. If you own a hardware store, for example, you might provide free delivery and assembly for some items. The key is to develop innovative ways to satisfy your customers’ needs and retain their loyalty. Hire (and keep) the best employees. Small businesses can be great places to work. By providing in-depth training and an enjoyable work environment, your employees will generally return the favor by treating customers well. On the flip side, we’ve all met staff members at nationwide chains who were inattentive or just plain rude. Small businesses can’t afford to ignore complaints or allow poor customer service. 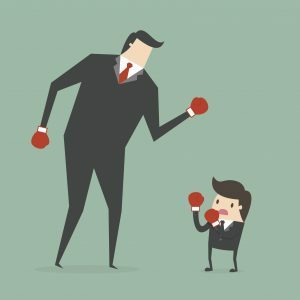 Don’t let one employee create a bad reputation for your business. Expand your sources of revenue. Maybe you own a coffee shop and well-known coffee company is moving in. Don’t throw in the towel. Add catering to the services you offer. If a larger competitor comes to town, you may lose some market share, but new sources of revenue can offset those losses. Differentiate your product or service. Maybe you provide fresher produce because it’s grown locally. Or perhaps you offer specialty items that the other guys don’t carry. Let your customers know about these differences, and they’ll come to you when something special is needed. Remember, there will always be room in the marketplace for businesses — whether big or small — that provide quality products at a reasonable price and friendly knowledgeable service.